Affordable, quality healthcare is entirely within our reach, and Dr. Franck Baudino, CEO of Health for Development (HD4), recently ushered me into his connected consult station (below) to show me how. I met Baudino at the SAP Financial Services Innovation Summit held at the SAP Leonardo Center in New York, where I was immediately drawn to the standalone, yet fully connected “pod” complete with everything familiar to anyone who’s visited their physician ‒ blood pressure cuff, stethoscope, glucometer, scale, and much more ‒ except with one major difference. 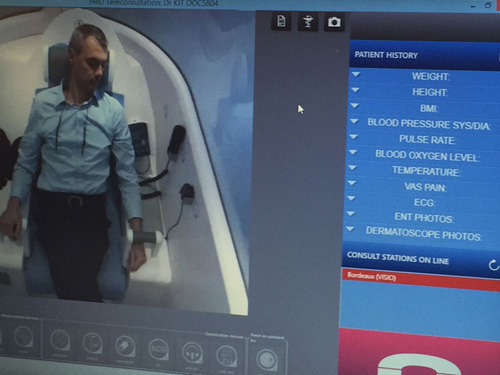 The state-of-the-art medical equipment within easy reach of the comfortable exam chair was connected by sensors and live video to a trained physician who guided patients through a confidential physical evaluation. Six years in the making, H4D is the result of Baudino’s experiences as a physician in developing countries, where it might have taken days to reach patients in need, if at all. Unlike time-honored, typically more expensive medical treatment that requires patients to travel to the physician, H4D brings more affordable care to people wherever they are located. Reclining in the comfortable exam chair, I had to agree with Baudino. Actual patients verify their identity by entering their access code and password. A pleasant female voice guided me through the first part of the visit, prompting me to enter my personal information on the touch pad, as sensors measured my vital signs including height, weight, temperature, blood pressure, and heart rate. Once the initial data is collected, a live physician appears on the video screen to talk the patient through the rest of the consultation. With locations in seven countries, Baudino said H4D has solved the major challenges of delivering telemedicine for primary, preventive and chronic care. Baudino described H4D as a medical service provider with Class II medical device certification that trains its physicians, and connects with the patient’s local healthcare records. The system runs on the SAP Cloud Platform. Patients can also conduct guided, DIY checkups that Baudino said are useful for employees in corporate healthcare programs. In fact, the company is initially targeting corporations, to be followed by creating provider networks in remote areas. Participating physicians are not employees of H4D, but use the medical service to expand their own practices. Previous SAPUI5 and C4C. My (un)expected journey. Part 1.